Each day New Yorkers swarm through the underground unaware of the hidden community which uses the tunnels as their home. An estimated 5,000 people live beneath the streets of Manhattan in a labyrinthine system of abandoned railway tunnels. Each day New Yorkers swarm through the underground unaware of the hidden community which uses the tunnels as their home. A gripping and eye-opening film which goes in search of an urban legend and discovers it is more than myth. 'New York is a great city - if you can stay on top of it.' In the pitch black only the rustle of rats feet and dripping water can be heard as the nervous film crew begin their journey to find New York's subway community. It's a dangerous mission in a place without law. 'Down here. You feel fears you never knew existed'. The film makers delve deeper and deeper, searching for signs of life. Torchlight illuminates fading graffiti, a discarded suitcase and the distant roar of rushing trains. Finally a dark figure reveals himself and we follow him to the mole community. Many of New York's tunnels and stations have became obsolete and have become the home of the city's dispossessed. It's a paranoid community who've left the comforts of the world above to get away from people. 'We don't like intruders. In fact, from this emergency exit, down to the train station is my territory, and I watched you guys coming' Gina's husband runs the community. A veteran with a degree in computer science, Gina moved into the tunnels 7 years ago. 'I can see you but you can't see me', Gina declares as she stops to push a stray tissue through a grate to hide evidence of her presence. 'Right in here, I killed a little girl', Bertrum confesses, also a former inmate who shot his sergeant in the head. But the tunnels have their own code of conduct as well and often 'it's more of a crime to steal from each other, than it is to murder someone. 'Whether hiding out from the law, homeless or suffering from a broken heart, the mole people of New York are running away from something. In the dark and frightening tunnels they find a home where society and their troubles cannot reach them. 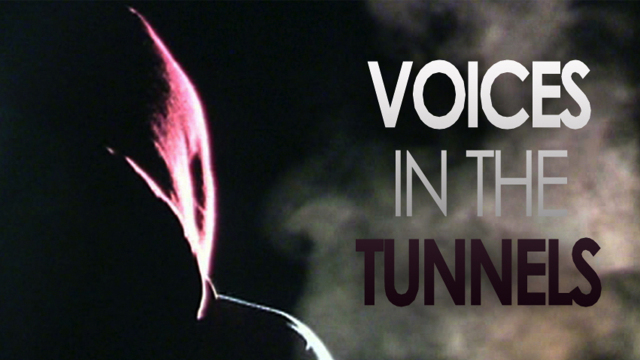 Voices in the Tunnels is at the same time an example of the best of investigative documentary and also a powerful comment on the social underbelly of US society. Enthralling and often shocking. Viktor David has been involved in film and television producing for over 20 years. Focusing on reality projects, Viktor David directed and produced a TV magazine, Real New York. In 2005 Viktors feature documentary 1/2 the Nation became official selection at Eureka International Film Festival. Since 1986 Viktor has been contributing to numerous projects, from feature films to TV magazines and broadcast documentaries including but not limited to: Heil Russia!  (Studio 7NY) a documentary about Neo-Nazi movements in post-Communist Russia; In Focus (QTN) a broadcast documentary delving into lives of homeless youth in NYC, Front Row and Face of Africa, TV magazines (Prime Time International for MNet, So.Africa); XXL, a Video Magazine; Blond Ambition a feature (Nuimage/Millenium Films); WAR, Inc a feature (Nuimage/Millenium Films); Home of the Brave (Winkler Films), a feature, Dovlatov  an independent documentary; Dissident (Moldova Films) - a feature film, and many other projects. Viktor has also worked with CNN, Discovery Networks, MTV Networks, G-UNIT Records, Bad Boy Films, Q Television Network, PBS, A&E, Ivanhoe Broadcast News, Graff Pay-Per-View and Group W.
Viktor received his education at the prestigious Tisch School of the Arts, New York University.